at left, John DeRiggi is pictured at right. had destroyed the previous day. John was one of the many heroes of World War II that put their lives on the line, so that you and I could enjoy the freedom that they fought so bravely to protect. I am very proud indeed to say that John is my brother. John got the nickname, "Johnny Boy", at a very young age. He received the nickname, because friends and neighbors often heard my mother or father yell, "Johnny, boy, if I get hold of you..."
John is the youngster standing on the right in the photo above. He is holding an M1 rifle in his left hand and wearing a French tanker's helmet. He had traded his American tanker's helmet for that of a French tanker. John was eighteen years of age when he entered the United States Army. He bravely served with General George Patton's 3rd Armored Division and was a member of the 3rd Armored Division Spearhead Battalion. He fought throughout Europe and was wounded twice. John fought in many major battles, including The Battle of the Bulge, and was a crew member of the first tank to enter Cologne, Germany. The German Mark V Panther that he and two of his fellow crew members are on top of , was knocked out by John's tank. The Mark V was knocked out shortly after it had knocked out an American M4 Sherman Tank. 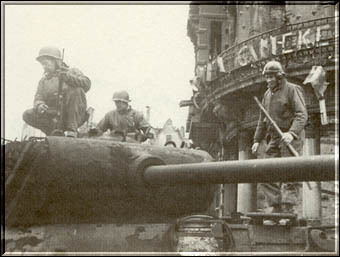 The Mark V was parked in front of the Cathedral on Cathedral Square in Cologne. The pictures on this and following pages were taken by an Army Frontline Photographer, Sergeant Jim Bates. While in France, John and a buddy single handedly captured about twenty German soldiers. John and his buddy had decided to check out a farm on the French countryside. To there surprise, two young French women approached and offered them some wine. As they stood next to a hay wagon, talking to the women, one of the young ladies alerted them that she had spotted about twenty Germans. The Germans were approaching along a dirt road toward the farm. John and his friend each had two pistols and a rifle. They thought quickly and placed the weapons on the hay wagon, spaced a few feet apart from each other. As the Germans got closer, they started to fire at them, rushing from one weapon to another. The Germans thought that it was a whole squad of Americans and decided to surrender. I guess watching those Saturday afternoon cowboy movies paid off. Maybe it was the French wine or maybe it was just because they were two brave young men. What do you think? John was the only man alive out of a crew of five in an M4 Sherman that had been knocked out shortly before The Battle Of The Bulge. John's tank had advanced into an open field, after exiting from a tree line. A German Mark V that was camouflaged in a tree line on the opposite side of the field fired one round from its high velocity 75MM, knocking out the American M4 Sherman. John had been rendered unconscious by the concussion of the blast and was slumped in the gunner's seat. When he regained consciousness after a few moments, he learned that the tank commander, the loader, and the assistant driver had been killed instantly. He heard a moan from the driver's compartment and laying on the turret floor, he stretched forward into the drivers compartment. The driver was slumped forward in his seat, so John reach forward and placed his hands around the drivers waist to pull him rearward. To his horror, his right hand went right into a gapping wound in the driver's stomach. The driver's head flopped backward and he looked up at John for a moment. His eyes rolled upward and he died in John's arms. It only took a few moments to realize that the German Mark V could fire another round at the M4 Sherman. John climbed up into the tank commander's seat and peered out the vision blocks. The Mark V had pulled forward from the tree-line and was perched on the bluff about seventy-five yards to his left. John grabbed a forty-five caliber machine gun, nicknamed a grease gun, and perched himself on the seat. He was in a stooped position and putting one hand on the hatch lever, he flung open the hatch and propelled himself out of the tank. John landed on the ground next to the Sherman, keeping it between himself and the Mark V. The tree-line that the Sherman had exited from was about forty or fifty yards away. It didn't take a genius to figure out that he had to make it to the tree-line. Peaking from behind the Sherman, John could see the Mark V, it's 75MM main gun still pointed at the Sherman. John took a deep breath and started to sprint toward the tree-line. With his first steps, a searing pain shot up his left leg from his foot. It wasn't until he started to run that he realized that he had been wounded in the foot. Pain or not, he ran as fast as he could, zigzagging, as he sprinted toward the tree-line. Suddenly there was a load swoosh and he was pelted with dirt as a round from the Mark V's 75MM tore into the ground next to him. The Mark V was obviously out of small arms ammunition and was firing it's 75MM at John. Fortunately for him, they were obviously out of high explosive ammunition for the 75MM as well. Two or three rounds of armored piercing ammunition tore into the ground as he ran toward the woods. I'd hate to tell you what would have happen if the Mark V's gunner was having one of his better days. 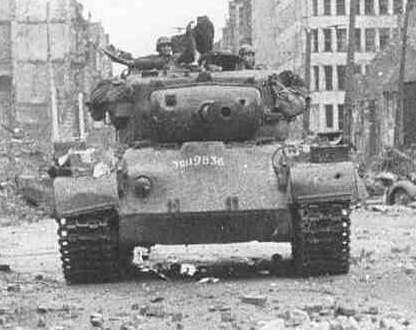 John made it back to the American lines and after mending for a short period of time, was reassigned to a new tank. It was one of those long awaited M26 90MM gun tanks that had just arrived in Europe. John was naturally grateful for surviving his ordeal, but was hell bent on revenge for his fallen comrades. As he once told me, "I shot at anything that moved..!" John was seriously wounded, sometime after the battle for Cologne. As a tank crewman, one knows all jobs associated with the tank. On this occasion, John was driving the tank. As they entered a wooded area, they could see some infantrymen that were pinned down by sniper fire. The tank commander asked John if he could see a particular sniper that was perched high in a tree. John replied yes and the tank commander asked him if he could get a shot at the sniper. John opened the hatch of the driver's compartment and raised his seat. Almost simultaneously with emerging from the hatch, a mortar round struck the tank, next to the hatch. The shrapnel from the mortar round tore into John's face. Unconscious and in shock, he had a pulse that was barely detectable. The crew members checked for a pulse, but couldn't detect any. Seeing all of the blood, being able to see his teeth through the side of his face, and not detecting a pulse, they thought that John was dead. They pulled him from the driver's compartment and placed him in a gully, along with some other casualties. When John regained consciousness, he tried to crawl from the gully. An infantryman seen his movement and under fire, he crawled to John's aide. The infantryman kept John from crawling out of the gully and called for the medics. Unfortunately, we do not know who that brave infantryman was. I sure hope that he survived the war and that he tells his grandkids about the tanker's life that he had saved. John's second wound was his ticket home, but not for about a year. He spent about a year in Army hospitals, first in Greenland and then in Valley Forge. The Army doctors did a good job with plastic surgery and his wound is barely discernable. There is still shrapnel in his face and being too close to his optic nerves, the doctors left it in place. From time to time, John has a difficult time breathing through his nose, because of growth around the shrapnel. As a result, John loves to be in the countryside and is an avid hunter. He is now seventy-four, but is still an expert marksman. John was a member of the 32nd Medium Tank Battalion, Third Armored Division, Spearhead. Little did I know at the time, but nine years later, I was to take tank training in that very outfit. I was surely proud to have that good fortune... One final note, I would hate to see what would happen to an American Flag burner, if John is within reaching distance..! Click the next button below to see photos of my brother's tank in action, an American M26 tank, with a crew of five. It was equipped with a 90MM main gun, a fifty caliber machine gun, and two thirty caliber machine guns.